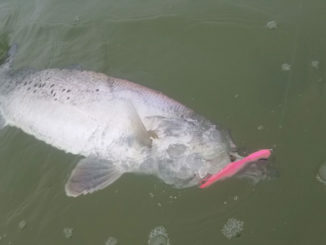 Jerkbaits will trigger strikes from speckled trout year-round, but they’re especially productive in cold weather. The longer it sits, the harder they hit it. 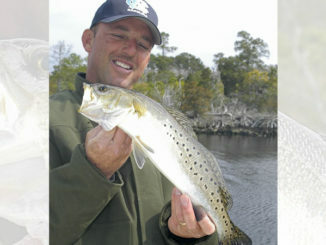 For those not familiar with the reference, it involves casting jerkbaits and the merciless response that a speckled trout exhibits after staring down its hard-plastic foe. Although this technique can be fished year-round, anglers across many state lines utter this phrase a little more often in the presence of Ol’ Man Winter. Proven repeatedly, erratic movement coupled with a brilliant flash resonates well with trout behavior. But anglers seldom embrace their true capability. I want to explore three simple facets — size, depth and action — to becoming a more-proficient jerkbait angler and explore some brands and what capabilities they provide. 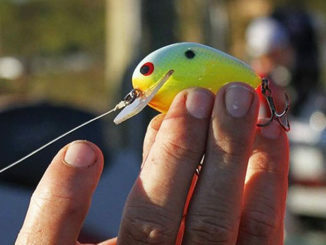 Spawned by bass anglers decades ago, jerkbaits have evolved to mirror our tech-savvy word. CNC machines replaced Buck knives and balsa wood, and as a result, offer anglers, regardless of fishery, a myriad of options. Flooded by “pro staff” marketing, the industry makes it tough for fisherman to sift through what works and what’s 40-percent off. For someone new looking to add one to their arsenal, size is the basic component that needs extensive consideration. I personally choose jerkbaits that range from 3 ½ to 5 inches long. I’ve caught big trout with large bits of forage waving at me from their throats. But I still feel most confident with lures in this range. Smaller jerkbaits like the Rapala RipStop 09 (3 ½ inches) offer finesse presentations on calm, clear days with exceptional water clarity. Larger profile jerkbaits like the Berkley Juke 100 present a heartier offering with a less-refined and cumbersome action. Aside from brand, which I’ll suggest later, size dictates flash and action. Given water clarity (dirty or clear) and conditions (windy or calm), having a variety in that range accentuates your offering. Normally dictated by the size of the rigid, plastic lip positioned at a 45- degree angle on the nose of the bait, its important to know the depth that the lure is rated for. How do you know? See the bait’s packaging for details. Jerkbaits like the Rapala Shadow Rap Shad present a larger offering. But they only get down to a max depth of 3 feet, depending on salinity and terminal tackle. Comparable in size, though, the MirrOlure L30 (MirrOlip), can reach depths greater than 6 feet, a result of a slightly larger lip. Having said that, both lure ratings fall within manufacturer specifications. Understanding that simple concept affords you to choose the right lure/profile for the job. Since the majority of fish are suspended, an angler can effectively target that portion of the water column. “Action” is a fishing word used loosely to describe lure characteristics. In this particular case, the action referred to is whether the bait descends, suspends or ascends after you finish your twitch cadence. Revisiting my opening comment about “the longer it sits” refers to all action types. Ascending jerkbaits like the Smithwick Rattling Rogue or the Texas Custom Lures MirrOlure Double D float back to the top. But they do so at varying rates of speed. Depending on whether fish are shallow or deep in the water column, the longer you can let the bait sit before it reaches the surface or bottom, the better chance you have at the fish responding to your presentation. To highlight my point, on a recent trip, I found some really nice fish in about 3 feet of water holding over shell. After throwing an ascending lure (Double D) with little response, I chose a Berkley Juke 100 with a deeper dive/ascending capability. After one great fish, little other interest was shown. So I swapped to a Rapala Shadow Rap (4 3/8 inches) which allows me to fish the middle column (1 ½ feet) with a suspending action. On consecutive casts, I caught and released two above-average trout. Taking stock, I found that the longer I let the lure sit ­— sometimes upwards of 5 seconds — the harder they would hit it. Due in large part to water temperature, clarity and calm conditions, the trout were keyed in on small movements. Ascending or descending baits just weren’t matching the fish’s behavior, but like all things fishing, it varies from day-to-day. This is the jerkbait game. 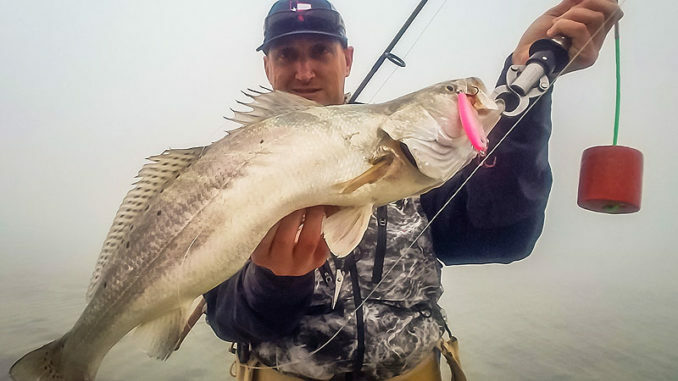 If observant and confident with a myriad of lures and in tune with their capabilities of size, depth and action, you can not only catch a substantial number of fish, but at the same time, you can target bigger bites. Hopefully this will help get you started. As always please reach out if you have any questions. Until next time, tight lines, God bless and remember take what you need and release the rest.